The Porsche 911 and Porsche Boxster from model year 1997 to 2005 have a high failure rate of the intermediate shaft bearing also known as an IMS bearing. 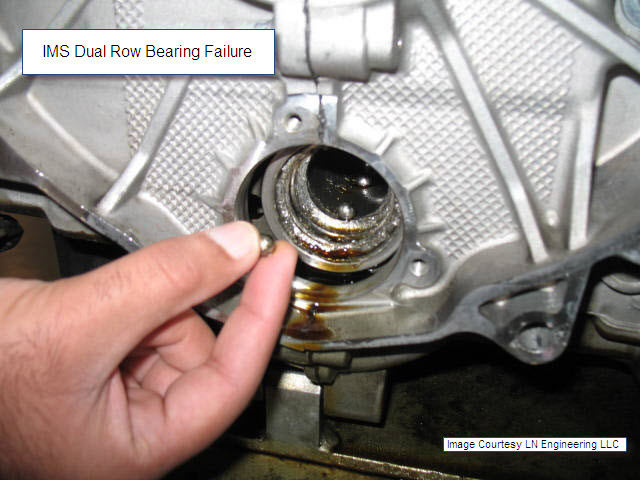 Its design and construction lead to premature failure of the bearing, which results in catastrophic engine failure. The intermediate shaft’s basic function is to drive the four camshafts via timing chains. 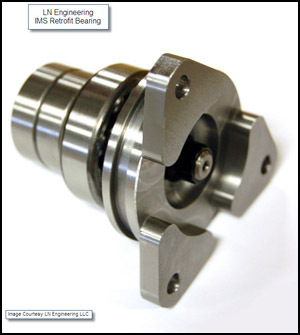 The bearing that typically fails is at the flywheel end of the crankshaft. Both the double row and single row IMS bearings in the M96 engine are prone to this type of failure. 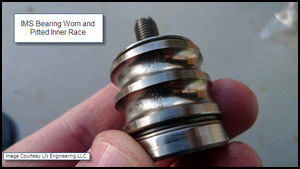 For a more detailed explanation of why the bearing fails please read this page at LN Engineering. We here at European Auto Tech always check for metal and plastic particles in the oil filters at oil changes. If particles are present there is a good chance the IMS bearings are failing. Plastic in the oil filter is an indication the bearing sealing rings are degrading and metal in the filter indicates the bearing itself is failing. be maintained, this is easily accomplished by keeping your cooling system in good working order and changing the engine oil frequently which means more often than the factory recommendation. 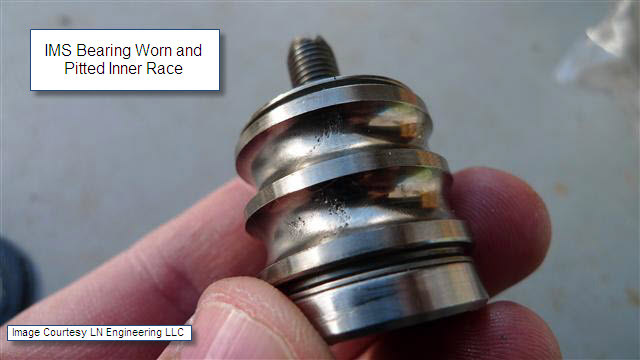 Keep in mind though that the original IMS bearing is a permanently “sealed” bearing, so in theory no engine oil can make it into the bearing itself, unless of course the seals are compromised. Because of the high failure rate of the IMS bearing, European Auto Tech suggests IMS bearing replacement when plastic or metal particles are found in the oil filter, a rear main engine seal is replaced, when replacing the clutch, or as a preventive repair before actual failure and engine damage occurs. The IMS bearing can be replaced with the engine in the car, except for TipTronic 911’s, by using the LN Engineering retrofit kit. 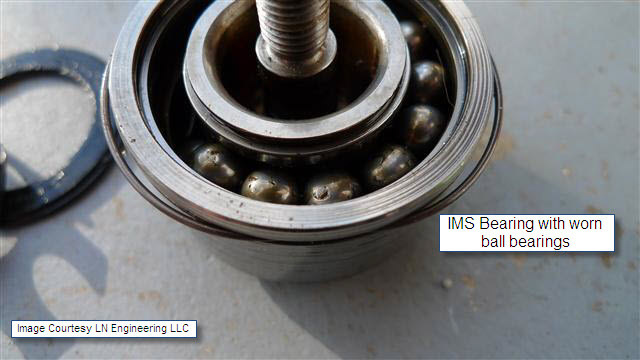 The LN Engineering IMS bearing retrofit kit uses “ceramic hybrid bearings” and Timken’s “sintered nitride ultra low friction roller balls” to improve wear and corrosion resistance. Other improvements to enhance durability include, a larger diameter center bearing shaft with a relocated o-ring and stronger chromoly flange hub. The retrofit requires the transmission to be removed, on TipTronic 911’s it will require removal of the engine and transmission, as previously stated. After removal of the flywheel, setting the engine on top dead center, removing timing chain tensioners, locking camshafts, we then use the puller designed by LN Engineering to remove the old IMS bearing and install the new LN Engineering IMS retrofit bearing. This is an involved job, and should only be performed by professional technicians experienced with Porsche engine repair. As an alternative to IMS bearing replacement, European Auto Tech suggests installing the IMS Guardian from LN Engineering. The IMS GuardianTM system relies on “Magnetic Chip Detection” technology which has been used in aircraft since the early 1970’s and even dating back to the 1950’s for monitoring the metal content in engine oil. The sensor consists of two strong, opposing-pole, permanent magnets with an insulated gap of air in between. Each magnet is connected, by a wire, to the wiring harness, comprising an open electrical circuit. The wired magnet unit itself is mounted in a modified oil drain plug replacing the stock drain plug, that goes into the crankcase sump plate. As oil circulates throughout the engine, the magnets will attract the smallest metal debris. This debris is caused by deterioration within the engine and the IMS bearing and is circulated within the engine oil. As the ferrous metal debris is captured in the center of the magnets, it will quickly build up to the point that it will bridge the gap in between the magnets allowing the conduction of electricity, and completion of the electrical circuit. Closure of the electrical circuit causes a warning light, installed on a switch blank in your center console, to illuminate and an audible alert will buzz. 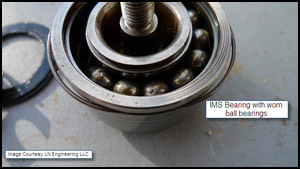 For detailed information on the IMS bearing failure, LN Engineering LLC and their products click here.